I took just one training session to teach Matilda how to show me when she was hungry, way back when she was a puppy, and she locked in this extremely useful communicative skill. It stemmed from my concern that I may someday forget to feed her. Or, that she might be in someone else’s care, and they may not know when she needs to eat. You would think that any perpetually hungry dog would take advantage, constantly communicating their hunger over and over again, expecting an endless supply of meals. And you’d be somewhat correct. Matilda does ask for food hours before mealtimes, and sometimes I oblige with a snack to hold her over. But mostly, it’s a handy way for her to express herself, and builds upon her realization that humans will do their best to help her if she communicates. At mealtime, stand by your dog’s empty food bowl. Wait for her to approach it. Most likely, she’ll sniff it to see if anything is there. When she approaches the bowl, mark her in your usual way, by saying “good girl!” or clicking a clicker. Then, place one small morsel of food in her bowl. Continue doing this with her entire meal. She’ll probably stare at you. Wait until she makes some movement towards the bowl. She’ll try different things to figure out what causes you to deliver the food. You may encourage her to tap the bowl with her paw by tapping or pretending to scratch at it yourself. If your dog is large enough to carry her bowl, you can have her hold it in her mouth for a moment, then mark and reward. Then, gradually encourage her to walk towards you while holding the bowl, just a few steps at first. A more complicated “feed me” signal will probably take a few sessions to master. You will probably only have to do this once, but you may practice a few more times before your dog starts to offer the behavior without prompting. Is My Dog Hungry, Or Just Trying Her Luck? You don’t necessarily have to adjust your dog’s mealtimes based on her signals. She’ll definitely signal early and often to test her newfound power. Simply ignore your dog when it’s truly not time to feed her, but occasionally offer her a snack if it’s an appropriate time for one. You don’t have to say “no!” or “it’s not dinnertime!” to get your dog to relax. The concept of extinction is psychology will take care of any nonsense signals. If you ignore your dog when she signals inappropriately, she will eventually stop when it does not result in an early feeding. At first, she may have a behavior “burst,” in which she’ll signal more intensely, kind of like how you mash the button on the TV remote harder when the batteries are dying. You may very well regret teaching this skill. It’s hilarious when 4-pound Matilda slams her bowls around, proving that she’s much stronger than she appears. 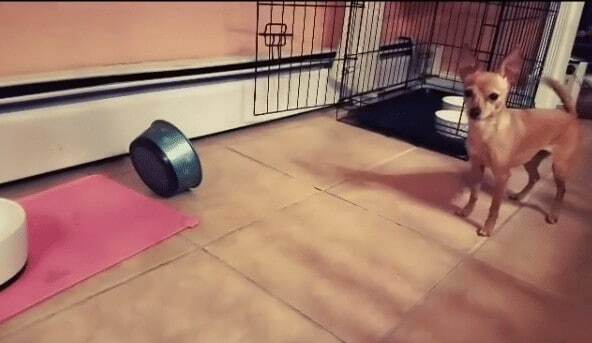 It might not be so funny when your larger dog throws their bowl across the room. Ok, that would be funny, too, but you’ve got to draw the line somewhere! Thank you Lindsay for all your good advice for our little pooches. Your caring heart and the love you have for your puppies really shows in all you do. It is so nice to have a site to come to for my little baby chihuahua Joey as well. Blessings to you always! Thank you so much Marie, your sweet comment absolutely made my day. I would love to see photos of your Joey, feel free to post them to the Little Dog Tips Facebook page or email me at Lindsay@LittleDogTips.com! What do you normally feed her, and how long has this been going on? Thank you to share this. To read this post now I know that when my dog is hungry, puppy etc. Hi Lindsay Pevny, all most same thing here. It was the time 1996 I got my first puppy and he had been taught from the scratch. My dog was seeking here and there for his food because he always remains hungry. I wanted to maintain a feeding time for him but he didn’t. Funny hah! I had sued the same techniques you have shared in your post here. Still, I can remember what happened to my dog that time. He wasn’t a quick learner at all. It was very hard to me. Tried to train my dog to use a bell to signal me if he’s hungry. Worked perfectly at first but after a couple of weeks it seems that he would use the bell just to get my attention. I tried feeding him but instead he would jump on me or pick his ball and give it to me. Thank you so much for this Tips Linsay this will be very helpful to those puppy lover. I used this method twice but my doggies jumps over me every time she’s hungry. What other method can you give? This is a great idea! I don’t think my dog will pick up as fast as your smart pup though! Cool tips. This is what I am looking for. My dog should be trained like this. Thanks.